Unlike other television dramas that have an anti-hero protagonist, Breaking Bad doesn’t rely on a crutch to give you permission to like and root for the villainous main character. Take for instance Dexter. The blood splatter expert/serial killer lives by his own moral code. He generally only kills those that “deserve to be killed”. In other words, he preys on those that prey on the innocent. The fact that Dexter kills other terrible people gives the audience a free pass to root for him and the violent things that he does without feeling morally compromised. Breaking Bad started out similarly. Walter White was a middle class teacher, diagnosed with lung cancer. With bills and debt piling up and only months left to live, he decides to cook meth to provide for his family after he checks out. This is the crutch I mentioned above—our excuse to root for Walt, despite his actions being terrible. But something happened—the writers kicked the chair out from underneath us. When Walter said in season one “I am awake,” he wasn’t kidding. While his motivations at the time seemed like they were for his family, the truth is, that was simply Walter’s self-justification. Death set Walter White free. Violence set him free. Breaking Bad in a lot of ways is the story of someone not only having to face what they truly are, but having the opportunity to have that kind of personal revelation. And for our protagonist, that is being a criminal that feeds off power and control. Since Walter’s goals have changed, it’s now less about a man doing terrible things for the sake of his family, as it’s about a man that loves power and defying authority—and embracing it. You could not have done a show like_Breaking Bad_without this kind of progressive revelation—without “kicking the chair out from underneath us.” We are so deeply invested in Walt that he can seemly do anything and we would still be rooting him. Just like Walter White, we are so deep into it, there is no looking back. I can’t think of too many shows where the protagonist does so many terrible things, especially to those around him, and yet we want him to go even further. This meticulous process every season has made Walt’s slow transformation believable. It’s also allowed the audience to ease into it. In season three, Walt had moved on to bigger things. Gone were the days of traveling in a beat up Winnebago to cook meth out in the desert. Now he was cooking in a professional lab secretly built under a cleaning supply center. His employer was a stable, a professional, who even owned a major chicken restaurant chain and knew how to do business without the violence. And yet, Walt still seemed to get into trouble by the season’s end. Walt’s Achilles heel is that he still holds on to his characteristics of his past life. He and Jesse might fight a lot, but deep down he loves him as a son, so much so that he was willing to kill for him so that he wouldn’t have to lose his innocence. But in Walt’s final act of desperation soon after this, he called on Jesse to make the ultimate sacrifice, and this is how season three ended, with Jesse having to look into an innocent man’s eyes as he begs for his life and pull the trigger. This of course is the complexity of Walt. He will go out on a limb to save those that he loves, but he will also use those very same people if it’s a means to survive. Season four starts with a flashback of Gale setting up Gus’ new lab. Gus is talking to Gale, and Gale is just in complete awe of the blue meth formula that Gus has provided him. Gale goes on to say the best he can do is 96 percent pure, whereas the blue meth sample was 99 percent pure. The conversation then comes back to Gale asking who made the blue meth, and why isn’t he working with him. Gus says: “I won’t happen, I don’t consider the man to be a professional.” And really this sets the tone and theme for the season. 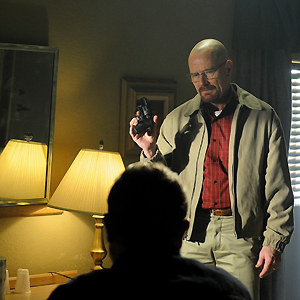 Gus underestimated Walt in season three, didn’t think he had it in him to do what he pulled off. And I imagine the rest of the season will be Walter trying to not only prove Gus wrong, but possibly taking over his position. Quickly we are knocked back to the present, only moments after Jesse has shot Gale straight in the face. In complete shock and despair, he just turns around and walks out. After being picked up by Gus’ worker Victor, Jesse is taken to the meth lab where he and Walt have to sit and wait for what comes next. The show then jumps to Skylar looking for Walt after being tipped off by her sister, who inquires about Walt’s car still being in the driveway. From here on out, the episode jumps around to Marie and Hank dealing with his paralysis problem, a great scene with Saul as he’s frantically getting ready to flee and Skylar trying to break into Walt’s apartment. At first all of these scenes might come across as being secondary to what we want to know—the resolution to what happens with Walt and Jesse. But the excellent placing of scenes makes the audience feel as nervous as Walt and Jesse as they wait for Gus. Sitting in a diner, wearing Kenny Loggins shirts fresh off the racks of a supermarket, Walt asks Jesse what their next move is. Jesse seems content with their current position. He understood what the box cutters represented and believes that it was their final warning. But Walt isn’t content. You can see it in his eyes, as he contemplated what is next for them. “Box Cutter” is everything a Breaking Bad episode should be. While it might not have been as explosive as the finale or “Half Measure,” it played on all of the shows strengths, building tension effortlessly, while bringing out the high caliber acting and cinematography we’ve come to know. With the seasons official tagline being: “Warning: Highly Volatile,” it’s hard to keep patient as we have to wait each week for Walter White’s next move, and perhaps his full evolution into a ruthless crime lord. • The obvious shocker at the end of the episode was that Gale’s “Lab Notes” folder was left in his apartment. What’s in it? Description of the lab’s design and equipment? Maybe his notes on Walt’s blue meth? • Jesse’s reaction to Victor’s death seemed cold. Whereas Walt was in complete shock, gripping his chest. We also see this contrast later, when Walt is too sick to eat in the diner, but Jesse has no problem chowing down. It will be interesting to see what direction they go with Jesse this season, and how him murdering Gale will impact his character. • The episode was based around Chekhov’s gun, except with a box cutter. • Did anyone else think the diner scene was an homage to Pulp Fiction? Reminded me of Jules and Vincent when they had to wear new clothes after throwing out their blood splattered ones.